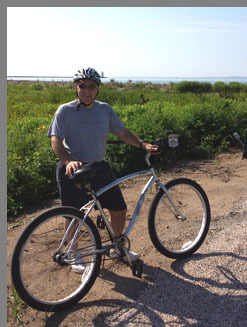 We experienced Old Saybrook, Connecticut by bicycle on a bright, blue sky sunny summer morning; something that we highly recommend. The Saybrook Point Inn & Spa provides complimentary bicycles for guests wishing to explore the area, thus we decided to avail ourselves of the bicycles, and take a slower means of exploration, and were happy that we did. 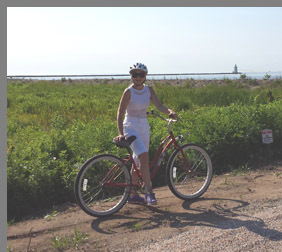 On an early Saturday morning in mid-July 2014, a day that was so bright, beautiful, and full of promise, we borrowed two bicycles and helmets from the Saybrook Point Inn & Spa and took off on an adventure because after all we are "The Adventure Kids - Debra C. Argen and Edward F. Nesta." Our purpose was enjoying simple pleasures with the goal of discovering this charming historic town that dates to 1635. As Old Saybrook is relatively flat with no real hills, it was perfect for an easy ride on "old-fashioned" bicycles translated as not bicycles not having gears to shift, no hand brakes to remember to use, and not electric. We left the parking lot of the Inn and followed the "bike loop" directions on the map provided, traveling down Bridge Street on a route that would take us on a 4-mile ride. Riding over the bridge we passed fishermen lined up at the rail hoping for an early catch of the day, and swans dotted the water in an almost too perfect to be real idyllic setting. Just beyond the bridge, bright yellow "black-eyed susan' wildflowers added a splash of color to the verdant landscaping. We continued our ride by diverting briefly into the "Fenwick" section, where the only sound was the trilling of birdsong and the occasional crack of someone hitting the sweet spot of a golf ball on the Fenwick Golf Course. The actress Katherine Hepburn and her family had a summer home here and it was easy to see why she loved the area with its water and lighthouse views, and where herons flitted along the banks of a marshy pond. Our ride took us over Maple Avenue, onto Plum Bank Road, and along Great Hammock Road, to Old Boston Road, and down Main Street. 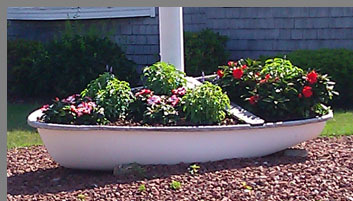 Along the way, we experienced stunning vistas, passed by private beaches, and rode by immaculately kept homes many with nautical elements incorporated in gardens bursting with color. We also had excellent views of both of Saybrook's iconic lighthouses: the Saybrook Breakwater Lighthouse, or Saybrook Outer Lighthouse, and the Lynde Point Lighthouse, or Saybrook Inner Lighthouse, easily differentiated by their shape and height. The Saybrook Breakwater Lighthouse, erected in 1886, located at Fenwick Point on the mouth of the Connecticut River, has a "sparkplug" shape and measures 48 feet (15 meters) in height, and is the lighthouse featured on Connecticut's "Preserve the Sound" license plate. 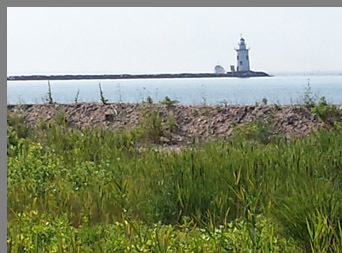 The Lynde Point Lighthouse, erected in 1803, has a conical tower shape, and measures 65 feet (20 meters) in height. 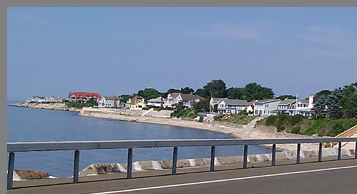 Coming into the "home stretch" on Main Street, we passed the historic Cypress Cemetery and the Fort Saybrook Monument & Park with its statue of Lion Gardiner before arriving back at the Saybrook Point Inn & Spa. Great exercise, new discoveries made along the way, and time well spent to stop and enjoy nature's beauty; not a bad way to spend an early summer Saturday morning before the heat of the day set in. Read about our stay at the Saybrook Point Inn & Spa in the Hotels and Resorts section, about our Sanno Spa experience in the Spas section, about our dining experience in the Restaurants section and in the Chefs' Recipes section where Chef Leslie Tripp graciously shares a few of his tempting recipes. Please visit their website, www.Saybrook.com, for more information on special packages and upcoming events. 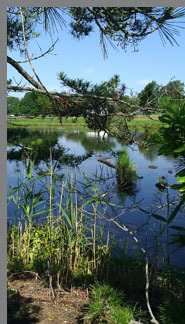 Read more about Old Saybrook and the area in the Destinations, and Adventures sections. 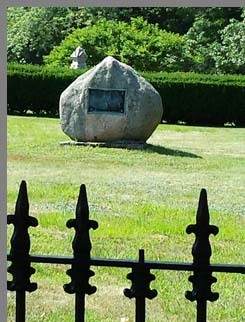 For more information on Connecticut, please visit the website, www.CTVisit.com. © August 2014. Luxury Experience. www.LuxuryExperience.com All rights reserved.